It has been three weeks and I am still digesting and processing what God did in our midst in Monroeville, Alabama. Some skeptics suggest revivals are obsolete, tents are outdated and evangelism is out the window simply because it is too hard or offensive. One respected church leader said years ago, “It’s not that revivals don’t work but too many Christians are not willing to come together and work!” Praise God the folks in Monroeville, AL had both the work down and the worship going up! I am pleased to report that God is still in the SOUL SAVING business! The Lord has a remnant of believers that are still seeking God on their face and with all their heart and we had a taste of the Trinity in a fresh, tangible way this past month. Without question, it was one of the easiest and most exhilarating times of my life but also emotionally exhausting. After the fine folks in LA (Lower Alabama) prayed for years for God to touch their community the Lord answered in a powerful way. Countless clergy, churches and Christians came together as a army of believers to lift up JESUS and reach their community for Christ. My friend Gerald Simmons led us to the throne with Brad and his amazing county-wide choir and you got to hear them action in video above. The tent was rocking while praising the Rock of Ages. A precious businessman from Florida donated the canvas cathedral and even paid for his hired staff to bring it in his 18 wheeler tractor trailer and had them to assemble what he loaned for FREE! One dear brother loaned the property and his pristine grass field became a parking lot that helped pave the way for scores to be ushered into God’s Presence. Talk about above and beyond hundreds of folks donated food feeding the masses nightly. They had everything from BBQ to burgers and it was not only delicious but Heaven on Earth! A local baseball team also assisted in erecting the tent and for months people prayed continuously for God to do what only He can do. Pastors of various denominations came together, got on their knees, rolled up their sleeves and walked by faith and in unity allowing God to minister and take the reins knowing He Reigns! A special shout out to John and Jeanette Bush for their amazing preparation in meeting with clergy, team leaders and opening doors in public and private schools. 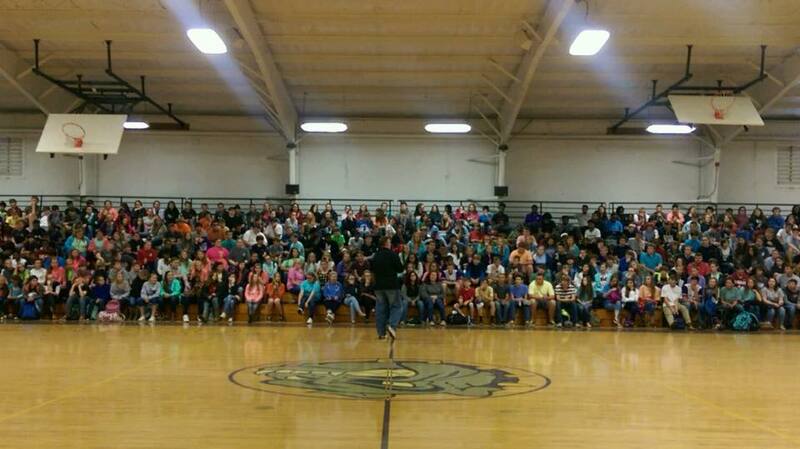 We were fortunate to get into a dozen public and private schools and speak life to thousands of teens while in town! The tent became the talk of the town but what was on everyone’s lips was not the music or minister but The Messiah. Jesus and revival was the word on the street and students were bringing their friends to the revival and trusting Christ as Savior! Senior citizens responded to the altar call and gave their life to Christ with tears. One 71 year old man got saved one night and two nights later brought a senior citizen friend and he got saved. A family of four got saved! One man’s two sisters got saved and two pastors of two different denominations both had teenage children of their own family repent of sin and give their life to Christ. Praise God! Folks were saved in restaurants after the services and people didn’t want to leave. Churches are having greater attendance because the saints that were stagnant are now back on the firing line not only bringing friends but leading others to JESUS! Saved people should want to see people saved! LISTEN to this brother’s testimony below (video) of family members coming to faith in CHRIST! The revival that was to conclude on Thursday night was extended TWO more nights. 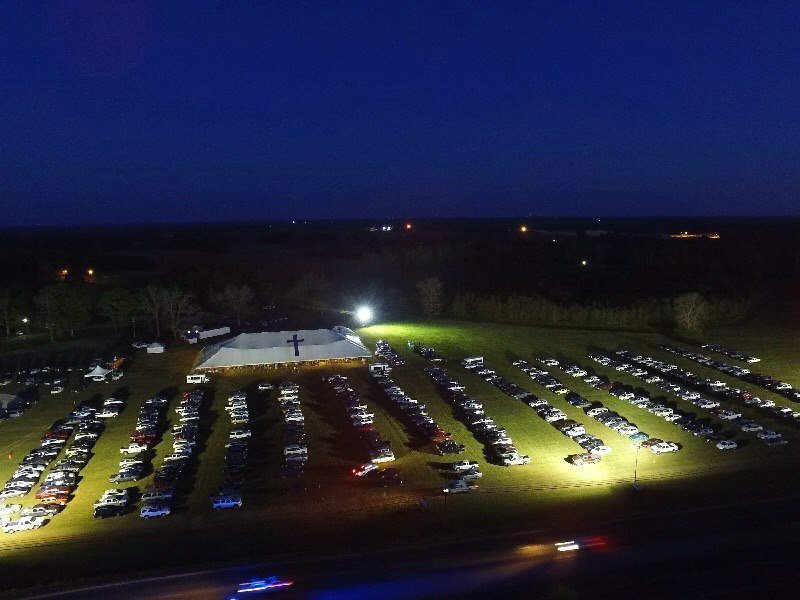 The tent averaged 2,000 nightly and over THREE HUNDRED and FIFTY FIVE SOULS were saved trusting Christ after hearing the Gospel. John Bush and his amazing team had 84 trained counselors that took a three week course in preparation to counsel those who would make commitments to Christ. We told them a decision must become a lifelong discipleship process. Counselors met one on one for thirty minutes in a adjacent tent praying with them, talking to them and answering questions to what just transpired, They also received some materials to help them grow in their walk of grace with God and are already following up with those who got saved. Folks to this day are still coming to the tent wanting the Presence of God. Reports are still streaming in of perhaps another fifty souls saved because of God moving in Monroeville, Alabama. You know it is a move of God when the meeting is over, the ministers have left and folks are still hungering for GOD! As long as I live I will never forget what God did in our midst and when some selfless saints came together and wanted desperately to see God invade their hearts and homes. For three nights in a row the rain try to dampen the move of God and mood of the people. We were unable to park on the field and a decision was made to park across the street and churches buses continuously shuttled folks across the road and dropped them off at the tent. One adult woman said, “It was the most joyous ride in my life. Everyone was talking about JESUS!” Interesting enough the crowds came and it may have worked in our benefit and God truly makes all things new! Dozens of calls have come in inquiring if the tent could be taken to different pockets of the country. Church leaders from three different states came to the tent to see if mass evangelism still works and all of them not only agreed but wanting to bring it to their region. The tent reminded me that God doesn’t need games or gimmicks but when we seek His Face and get back to basics He shows up. At the three minute mark you can watch firsthand of citizens of Monroeville share what God did in our midst. The Bible is clear, “He that wins souls is wise” and may the revivals that started in Alabama engulf to an enferno across America and beyond. This is God’s doing and glory to His Name! So Glad God Sent You Through Monroeville Alabama! Fire In The Field! Glory Hallelujah! WOW, this is Awesome!! My friend Frank Shelton is doing what God is leading him to do. This Fire in the Field, Please help me Pray for him Physically and Mentally, and most Importantly Spiritually, he is doing what God has called him to do. I feel God is on the move, and I told my friend the other day, God is up to something, and I feel like something is about to rupture, and I’m so glad it is…I’m praying something like this could happen here in our lil part of the country..Frank, can you bring the tent to NORTH CAROLINA? Call Frank today and schedule him to come to your area, watch God build His Kingdom, and grow His Church!! All the Honor and Glory goes to God, but thank YOU for sharing your faith and desire to lead others to Christ with all of us!! And thank you for all the effort and time you spent visiting our area schools to share the love of Jesus with our young people!! The week was a much needed time of renewal for me, and I received a blessing every night! The enthusiasm shared by the praise team was so uplifting, and I’m thankful for the opportunity to participate in the choir along with such gifted and talented individuals. May God continue to use and bless each of you, for His Glory! Bro. Frank, What a blessing to hear all the great blessings that happened. We were praying for you all the way in Brazil here in São Paulo that God would do a wonderful work! We rejoice with you and look forward to hopefully see you while preaching during Olympics outreach (August 13-23) in Rio de Janiero. What a blessing to see God save so many!!!!! The blessings just keep on coming!!! Even back in my own church the Sunday morning after the revival, the Spirit of the Lord was powerful!! Thank you and your family for letting the Lord use you in a mighty way. Glory be to God for the great things He has done! Amen….that’s an awesome testimonial for the Lord. Keep up the good work for Him brother! Much love and prayer from Texas! God Bless. That’s amazing!! Miss hearing you preach. When you coming back to Burgaw, NC? Amazing Mr. Frank! I have thoroughly enjoyed being a part of Fire in the Field!! How awesome it is to see my Christian brothers and sister in Christ come together and worship ALL MIGHTY GOD. I pray God continues to release His power, glory, and anointing to every person that come to “Fire in the Field.” I pray souls be delivered, healed, and set free by the power of God. You all be encouraged, keep waving the blood stain banner for our Lord. I love you all and may God continue to richly bless you. Wow….Kinda reminds me of those tent revivals Billy Graham used to have. I”m sure that has to be a blessing to you and those who attend. Prayers for you, my brother. Frank we are so proud of you in CA. You are certainly one of America’s emerging evangelists. Love following what God is doing through you my friend and look forward to catching up with you on the West Coast. Frank, you are truly anointed and a vessel for our Lord and Savior!! Awesome job during revival! Can’t wait to work with you againt!! Lifting you in prayer and hoping you find time, somewhere in your busy schedule to rest. What a blessing you are! !